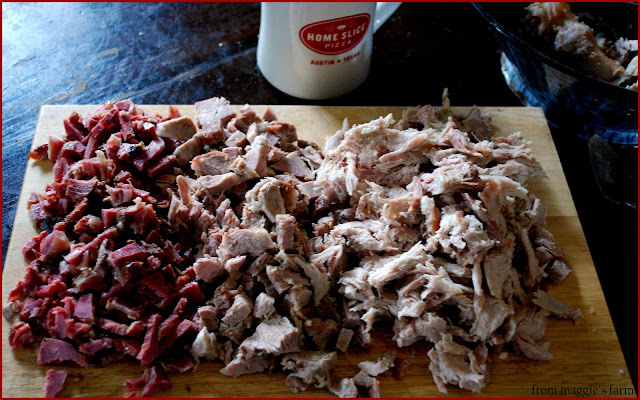 Head cheese, a type of charcuterie also called souse and brawn, is a highly-seasoned jellied loaf of meat scraps, most commonly pork. 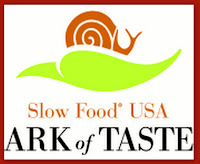 It is a member of a list of somewhat 'endangered' foods called the Ark of Taste, promoted by Slow Food USA, an organization dedicated to the pleasure of wholesome, traditional food with a commitment to community and the environment.. 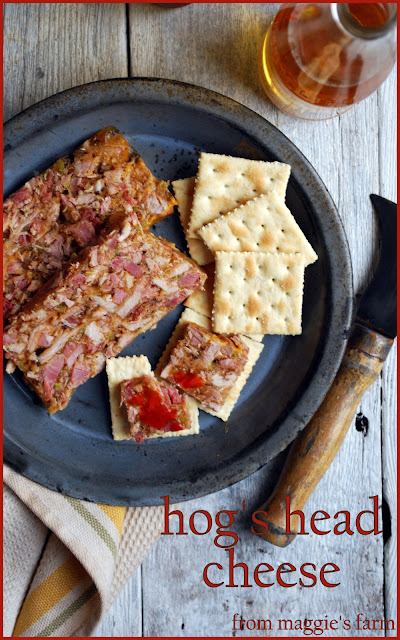 Originally hog's head cheese was made entirely from the meaty parts of the head of a pig or calf. This version is a tad more, shall we say, domesticated, using traditional pork cuts, and derives its gelatin from a box, rather than a head. 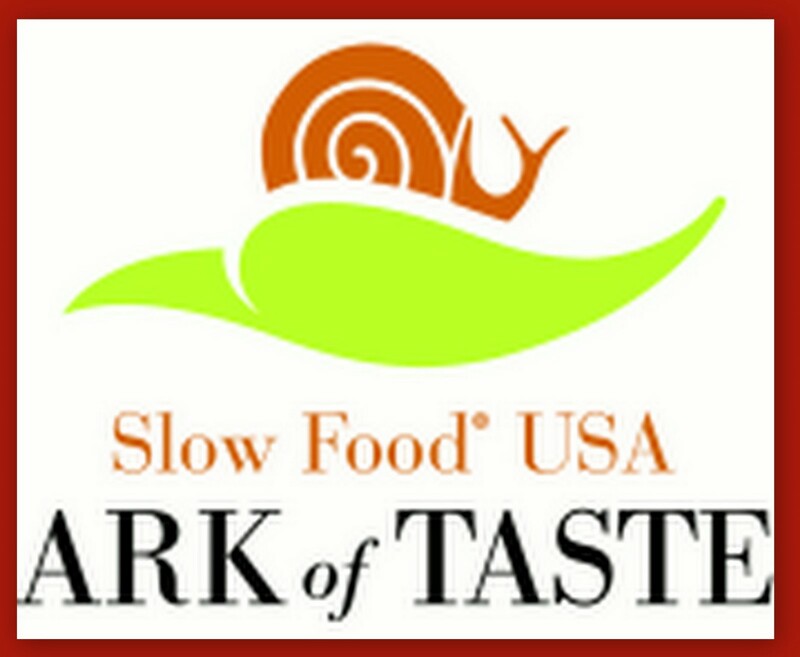 based upon a recipe in Alton Brown's Feasting on Asphalt, which itself was inspired by Bailey's Andouille & Produce, LaPlace, Lousiana. The process for the recipe is based solely on Brown's recommendations, with few modifications. Place roast and ham hocks in a 6-quart stockpot and add garlic powder and water. Bring to a boil over high heat. Lower the heat, maintaining a low boil, and cook, uncovered until the meat is falling-apart tender, about an hour. The water will have decreased. Add or remove enough water to make one quart. Remove the meat and ham hocks from the pot, allow to cool, and refrigerate. Place cooking water, uncovered, separately, to cool in refrigerator about 3 hours, or as long as overnight. Once cooled, remove the layer of hardened fat. 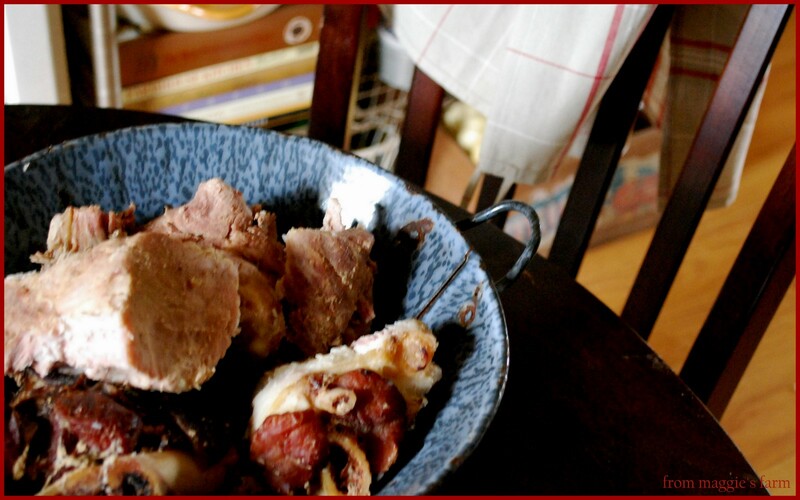 Remove rind from ham hocks, discard, and pick meat from the bones. Chop 1/4 of pork shoulder into 1/4inch cubes, and shred remaining meat. Place the gelatin in a small bowl and pour 1 cup of light beer over. Set aside. Return the meat to the cooking liquid (now congealed, likely) and add celery and remaining spices. Stir well to combine. Bring to a full, rolling boil, over high heat, for 6-8 minutes. 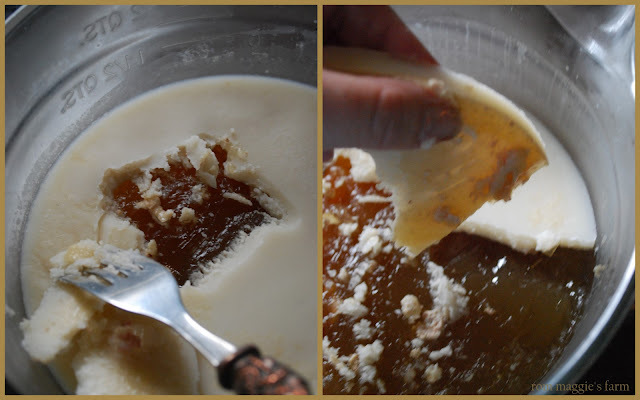 Remove from heat and stir in dissolved gelatin/beer mixture. Pour into loaf pan, terrine, or individual molds (our loaf was molded in a 9X5 pan) and allow to harden, overnight, in refrigerator. 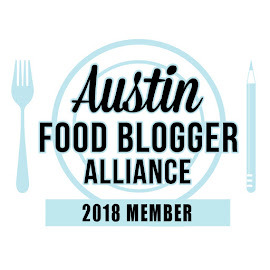 Slice with a sharp, serrated knife and serve, traditionally, with saltines and your favorite hot sauce (ours is Louisiana Hot Sauce) for an appetizer or light lunch. 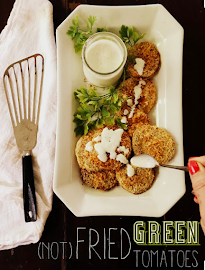 Brown suggests melting over hot grits for breakfast for a (really rich!) hearty breakfast, too. 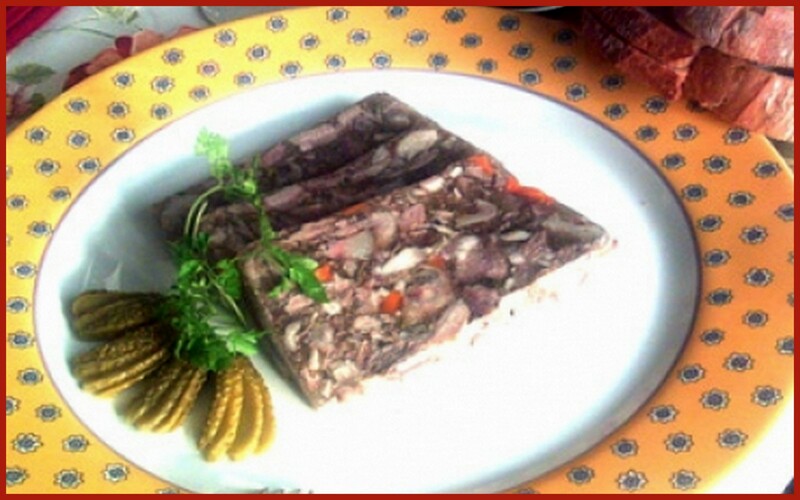 As you see, no hog's head was used in the preparation of this Hog's Head Cheese. Traditionally, the dish was prepared by boiling a hog's head (um, 'cleaned' and hollowed out, nose down) in a (head-sized) pot of boiling water, then allowing it to cook down until the meat began to fall from the, um, skull, and most of the, um, connective tissue dissolved. You remove the, um, stuff that doesn't, like the skull, add the seasonings, remove and chop up the meat, reduce the liquid concentrating the gelatin (no Knox, back in the day), then mold and allow to set. Some home cooks still use this traditional method, along with adding pig's feet and other, um, assorted items (truly the first waste-not-want-not cooks of recent history) to lend an even more gelatin-concentrated flavor, but by law, no modern commercial preparation involves cooking in the hog's head, in the United States. The French have a similar product, named fromage de tete a l'ancienne, which Google translates to English as Cheese Head to the Old,. I think I may be a cheese head to the old. Or just an old cheese head. Ohhh decadent! I would love some. NOW! I was planning to make another batch for the last swap. Next swap, maybe? creole vs. cajun: vive la difference!